When political candidates rely on non-constituent donors for a significant portion of their campaign funding, democratic self-government may be affected because the policies and preferences of non-constituent donors often differ from those of constituents. 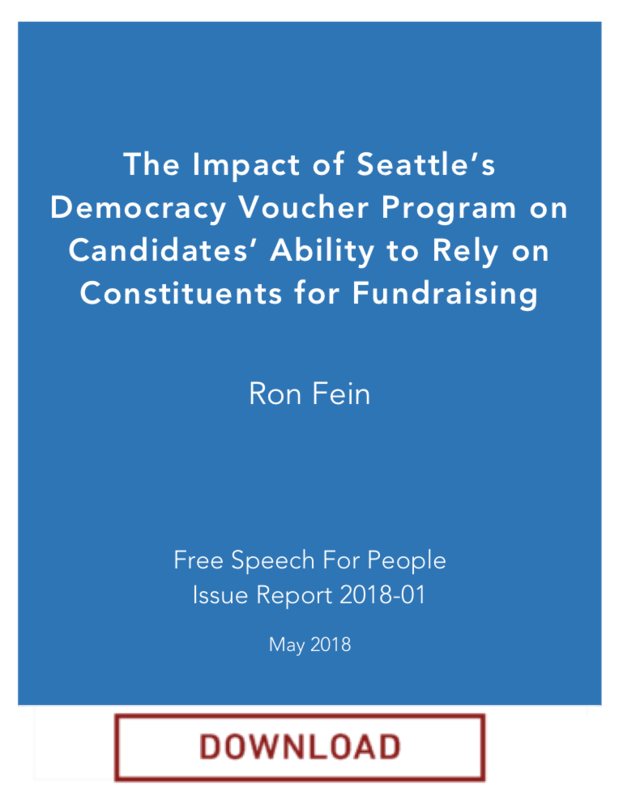 The objective of this analysis was to examine whether Seattle’s recently-passed democracy voucher program led to candidates relying more on constituents, as opposed to non-constituent donors from other parts of the state or country, for their campaign funding. The results indicate that candidates who chose to participate in the voucher program raised a notably higher percentage of their funds from constituents than the typical percentages raised in pre-voucher elections, or by non-voucher-funded 2017 candidates. Before the voucher program, recent candidates for Seattle city office generally raised 65-80% of their funds from in-city. In the first voucher election, city council positions 8 and 9 saw a dramatic increase in the percentage of contributions from Seattle residents, with 93% or more of contributions coming from in-city. The city attorney candidate who participated in the voucher program saw a similar increase into the 90% in-city range from 2009 to 2017. In contrast, candidates who did not use the voucher program—either because they chose not to participate in the program, or ran in the mayoral race, which was not eligible for vouchers—raised funds in-city consistent with pre-voucher levels. The overall trend is clear: the democracy voucher program enables candidates to raise the vast majority of their funds from constituents, as opposed to out-of-city donors. Free Speech For People joined with Greenpeace on the report, Contaminating the Courts: The Corporate Campaign to Misuse the Constitution to Attack the Environment, to challenge corporations claiming constitutional rights to avoid accountability under the law. With this report, Greenpeace and Free Speech For People trace the history of the coordinated corporate strategy to distort constitutional rights into tools to thwart environmental and consumer protections, including recent attempts by Exxon Mobil to claim free speech rights following the uncovering of decades of misleading statements by the company regarding the impact of fossil fuels on climate change. Corporations are trying to use concepts that were intended to protect vulnerable, marginalized individuals and groups in the service of legal entities that wield incredible power and wealth. Free Speech For People and Greenpeace are fighting back against attempts by corporations to misuse the Constitution to undermine important health and environmental protections. In the U.S. Court of Appeals for the D.C. Circuit’s SpeechNow decision, which created super PACs, the court theorized that contributions to so-called “independent expenditure committees” could not possibly result in corruption. In the real political world, however, as this study shows, top donors to super PACs and other independent spenders are not only contributing to these groups. They are simultaneously giving directly to the very candidates who benefit from their contributions to independent spending. The typical two-track donor supports multiple candidates in this fashion. Thus, while independent spending groups are legally restrained from coordinating with their beneficiaries, donors to such groups are legally permitted to financially coordinate with these same candidates within certain contribution limits. When donors amplify their legally limited direct contributions to candidates with unlimited indirect support via independent spending groups, an “anti-corruption interest in limiting contributions to an independent expenditure group” certainly arises. These unlimited contributions intensify the dangers of quid pro quo corruption and its appearance that contribution limits were established to prevent. “This research undermines the judicial theory that large contributions to super PACs cannot create even the appearance of corruption. The data show that the vast majority of big super PAC donors also make large direct contributions to the same candidates that they subsidize indirectly via super PACs. Since the donors are financially entwined with their favored candidates, their additional support through super PACs intensifies the danger of corruption. In “Part II: Undermining Federal Limits on Contributions to Political Parties“, the report follows the top 100 individual and 50 organizational donors to independent groups in the 2012 and 2014 elections. It focuses on those who gave to one or more of the six official national party committees and also contributed to unofficial party-linked Super PACs active in the same election(s). 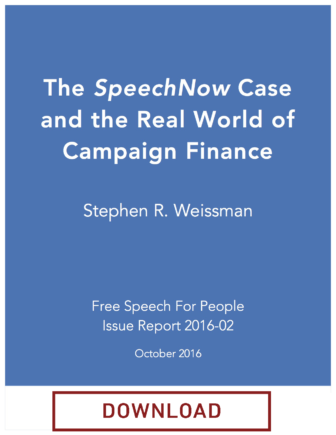 The present study examines the same universe of top outside money donors to the 2012 and 2014 elections. The analysis focuses on donors who contributed to national party committees in a particular cycle while simultaneously donating to independent, party-linked Super PACs in the same elections. It turns out that a considerable proportion of top individual and organizational donors to independent groups – approximately 40 to nearly 50% – followed a two-track policy of making legally limited contributions to party committees while also providing massive funds to party-linked Super PACs for the same elections. For example, in 2014, the maximum a donor could give to a party committee per year was $32,400; assuming a donor who gave to all three committees of one party, that’s $97,200 to party committees. Under federal law, $97,201 would be illegal—too high a risk of quid pro quo corruption—but that same donor can give millions to party-linked super PACs. In essence, donors can multiply their legal direct party contributions by giving to party-linked super PACs at levels far beyond what Congress has determined is necessary (and the Supreme Court has so far upheld) to protect against corruption. This pattern of giving completely undermines the limits on contributions to parties. The large donors surveyed in this study made very substantial contributions to their preferred party committees. The size of these contributions, while within legal limits, assured that these donors would be noticed by party fundraisers, many of whom were themselves candidates and elected officials. When these donors simultaneously embellished their financing by massively subsidizing independent Super PACs linked to the same parties in the same elections, they intensified the danger of corruption and its appearance. 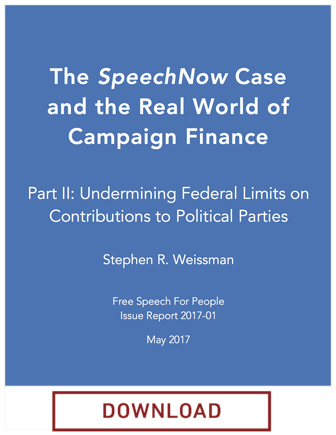 By ignoring such political realities, the SpeechNow decision has helped undermine federal contribution limits, the primary means of federal regulation of campaign financing. “Six years ago, the Supreme Court’s Citizens United decision opened the door to corporations spending money to influence our elections, and the dissent warned that corporate political spending could become a pathway for foreign influence. The Federal Election Commission, and the local government in St. Petersburg, Florida, have been exploring potential rules to address the risk of foreign investors leveraging their ownership stakes in U.S. corporations to advance their interests through corporate political spending. 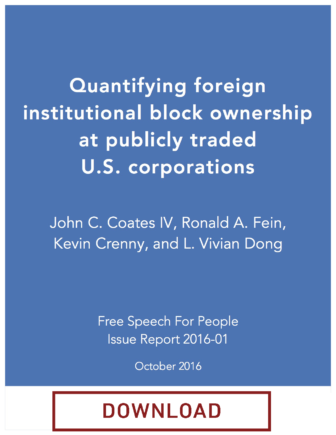 This study shows that about 1 in 11 companies on the S&P 500 have one or more foreign or foreign-controlled investors that own enough stock to be required to report their ownership stakes to the federal government. 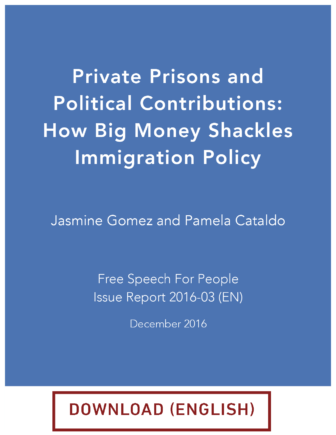 According to a report released December 14, 2016 by Free Speech for People, private prison companies and prison guard unions spent millions of dollars to lobby and elect both Democrats and Republicans into office. This includes funds donated to president-elect Trump, that apparently violated campaign finance laws, and funds given to Democratic Governor Jerry Brown. The report follows the money to see what these candidates support when it comes to issues related to immigration reform. The report discovered that Governor Brown, one of the only Democrats to receive donations from private prison companies and prison guard unions, used his power to veto the “Dignity Not Detention Act,” which had overwhelming support with state legislatures. It also found that if Trump keeps to his words, there will be millions of undocumented people held in immigration detention centers while they wait for court deportation proceedings, driving up private prison stock value. Both decisions are profitable to private prison companies, and neither provides solutions for immigration reform. 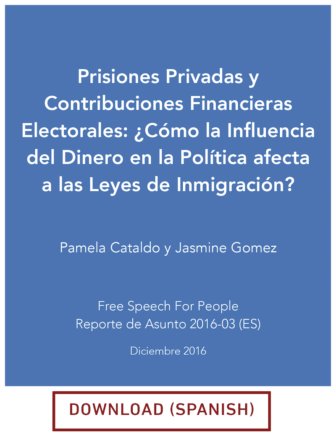 This bilingual report highlights examples of the biggest roadblocks in American democracy — money in politics. The Supreme Court’s decisions in Citizens United v. FEC ruled that money should have “free speech” protections under the Constitution, meaning wealthy people (and now, since Citizens United,corporations and unions) can spend unlimited amounts of money in politics. Studies show that middle and low income voters have virtually no effect on the policies Congress recently enacted. Instead, Congress listens to those with the most money to spend on their elections. This has left us with a nation that is now run by, and largely for, the wealthy few.